It's easy to feel helpless when faced with the world's problems. There are so many to fix, where do you even begin? It's all to easy to dismiss yourself as too small to help, too busy or too useless. Every so often, however, something happens that forces people to mobilise. Something so loud that it silences that nagging voice in our heads saying we don't have the time or skills to make a difference. Something big. The harrowing photographs of a child, his life cut short as his family tried to find a safe place to call home, have spurred the world into action. Where last week there were unsympathetic and bigoted headlines, now there are calls for help. Where there stood politicians firmly refusing to help, now there are promises of change. Not huge change, certainly not enough change, but some change. I wrote down my thoughts when I first saw that photograph, the one that kept me awake for most of the night, thinking about my own three year old. Thinking about how two children bought at the same time can have such different stories. Thinking about how fortunate we are for everything we have, to have each other. Wondering how I could help. I'm lucky to live in an area that is welcoming refugees with open arms. My local council announced long before that world-changing photograph that they were going to offer homes for 1200 refugees. Not all councils have been so compassionate. If yours hasn't, join the campaign and ask them to. Over 11,000 children have died in Syria since the war broke out. A million more have fled their homes. Their homes, filled with happy childhood memories, are no longer safe for them. Save The Children are helping to provide the children in Syria with food, safe water, medicine and shelter. They are keeping children safe where the international community is failing to. 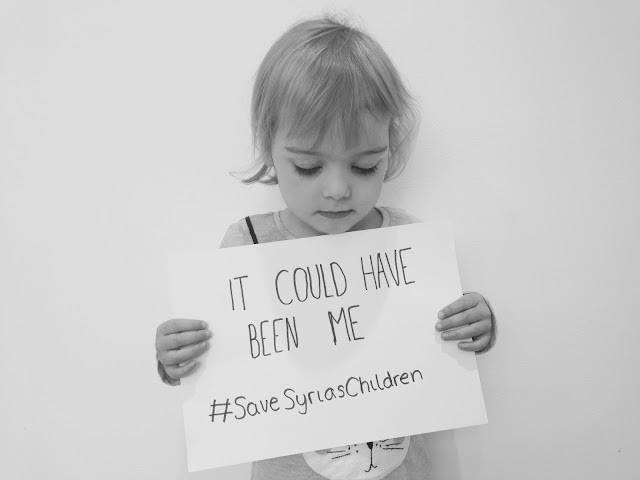 You can donate £5 to the Save The Children Syria crisis appeal today by texting SYRIA to 70008. Or you can donate online if you'd prefer. The terms and conditions for donating via text message can be found here.